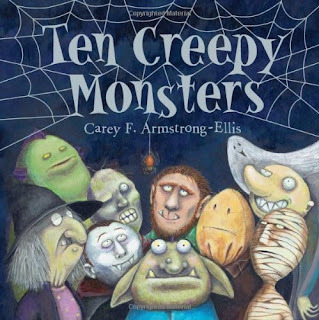 Last week I mentioned ordering two new books for our Halloween book stash: Ten Creepy Monsters and Ten Little Pumpkins. I had a significant reaction to both books. The kids and I had a really good time reading Ten Creepy Monsters. Ten Creepy Monsters starts out just like the title says - with ten monsters. One by one something happens to each monster. Ten creepy monsters met ’neath a gnarled pine. The premise for Ten Creepy Monsters is so cute and each monster is eliminated in a creative way fitting to that particular monster. (In the example above, the one that blew away was a ghost.) My only complaint is it was a bit over my kids' head. I had to explain what happened to each monster. It's a small complaint because I enjoy having discussion while we are reading, but it would have been even better if my kids' joy wasn't delayed before catching up to mine. My favorite part of Ten Creepy Monsters is the ending. I absolutely love when a simple picture book gives a surprise ending. The kids and I immediately turned back to the first page so we could read it again knowing how it ends. If you are anything like me, Ten Little Pumpkins will drive you insane. My kids enjoyed it. They loved counting the ten pumpkins in each picture spread. I don't think they even noticed how hard it was for me not to make a complete mess of the story or the numerous looks I exchanged with my husband. Ten Little Pumpkins is a "Sing and Read Storybook". The words are set to the tune of Ten Little Indians. The idea is you can open the book and sing through the pages. The first verse of pages were fine... One little, two little, three little pumpkins... concluding with ten little pumpkins in a patch. Just like the original ten little indian boys. After that, the book is all jacked up. The syllables in the verses get more and more unlike those of Ten Little Indians finally ending with ten trick-or-treaters on Halloween night. How on earth do you sing song that? If you can make ten trick-or-treaters on Halloween night sound like ten little indian boys, could you please call me? Storybook Sunday is a feature here on Book Den where I talk about the books I'm reading with my kids. Let me know if you'd like to join in! I need to get Ten Creepy Monsters for Gage. He's been a little spooked by the Halloween parties and stores this year.